When I was too small to remember it happening, a Chinese American family moved in across the street from our tract home in Sacramento, California. Apparently, at the time, they were the only non-white people on the relatively new block. One set of their white next door neighbors were not very happy about this, and went so far as to walk the neighborhood asking neighbors to sign a petition demanding they move. The thing I love most about being told this story later on was the part about how my parents handled it. Not only did they refuse to sign it, but they immediately went over to meet them and extend their friendship. By the time I was old enough to hear that story, our families had already shared years of kids playing together, Moms having coffee in the kitchen and Dads visiting on the curb during a break in yard work. My younger sister and their two youngest kids pried open their bedroom screens for early morning visits and cut their hair together while hiding in my parents master bedroom shower stall. Once they ate half a bottle of aspirin and Velma, their mother, and Jeanne, my mother, fed them ipecac by the spoonful until they puked it up. Both Moms referred to “putting their faces on” before driving us to school and they cried together at my Mom’s kitchen booth the first time Kathy and I went off to Girl Scout Camp together. Both our households were “second generation” ones–meaning our grandparents had come from what used to be called “the old country.” It made sense to me that Kathy’s grandmother spoke Chinese when she called on the phone, since my own Canadian French Grandmother resorted to French when she didn’t want us kids to know what she was saying. My Dad was fluent in Italian, which was spoken at home when he was growing up. He didn’t really learn Englsih until he went to kindergarten back in Utica, New York. These old country connections made for a very interesting mix of traditional food with standard American fare. We all learned things from one another. As a good friend to their oldest daughter, I was often invited for dinner. I would watch with fascination as Kathy meticulously washed rice for dinner after school. We’d have Chinese food with chopsticks, along with big plastic tumblers of good old American milk we had to finish before leaving the table. At my house, if we wanted, we could have the tiniest bit of wine in our lemonade with dinner.I tried candied ginger for the first time at their house. And sour plums. And kumquats. At our house it was pomegranates and figs. The adults would share things too. Italian cookies and lasagna or braggiole made their way across the street. And Velma brought her traditional congee, which she called something that was pronounced somewhere between “yoke” and “joke” for my father when he was recovering from the flu. The story that everyone laughed about as much as they later laughed about the mix of shorn blond and black hair in the shower stall went something like this. My Dad was famous for putting parmesan or romano cheese on everything he ate. To him, it made everything taste better. Presented with this authentic Chinese specialty, which he smelled and said looked great, he promptly sprinkled it with parmesan even before tasting it, amidst loud exclamatory protest from me and my Mom, and then pronounced it delicious. He never lived it down. I hadn’t thought about this funny and wonderful mixture of food traditions for decades. But when I learned about this Burmese style tofu on McDougall Friends and experimented with these recipes, it all came flooding back. Turns out there are lots of recipes and even two non-soy foods you can make Burmese style tofu from: chickpea flour or yellow lentils. It’s not quite like Chinese or Japanese soy tofu, and not quite like polenta. But it’s kind of like both. Asian and Italian. Which made me think of my childhood, and then Marco Polo, and how the legend goes he brought noodles back to Italy from China. And how carrying our traditional food across the street to one another while I was growing up is just part of a long chain of creative food fusion I am still having fun with. 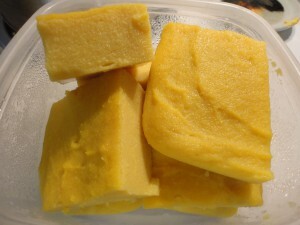 The least time consuming way to make Burmese style tofu is with chickpea flour. There are lots of recipes out there. Most of them make way more than I would want or need, and some of them seemed rather fussy. But this one from Delicious Everyday has the goldilocks charm of being “just right.” It makes a realtively small amount (which is more than enough for a few meals) and the directions are straightforward, uncomplicated and clear to follow. If you’d like to try your hand at it, be sure to go on over and follow the directions there. That’s what I do. The second way to make Burmese Style tofu, called Shan Tofu, takes a little bit longer because it’s made with yellow lentils that have to be soaked first, but it doesn’t require much extra attention. I read a recipe for how to make it here, on Wellbody Blog. Delicious Everyday’s recipe technique made so much sense to me, though, that I decided I would merge and tweak directions from the two sites to make my own version of yellow lentil tofu. I’ll share that with you here. This is a suitable version for those avoiding flour. Soak the lentils in warm water to cover overnight. Drain and rinse and put in your food processor or blender. (I used my food processor so my directions are for doing it that way. If you use a blender you may want to add the water first, then the lentils.) Blend the lentils, salt and tumeric toward becoming a smooth paste, stopping to scrape down the sides. When it seems pretty much there, add 1/2 cup of the water. Process some more, and scrape. Add anoather 1/2 cup of the water. Process until as smooth and lump-free as possible, stopping and scraping the sides as needed. Have an 8 x8 pan ready to pour your finished paste into. Delicious Everyday recommends oiling it with a small amount of oil. I tried it with 1/8 of a teaspoon but I’m not sure it’s necessary. 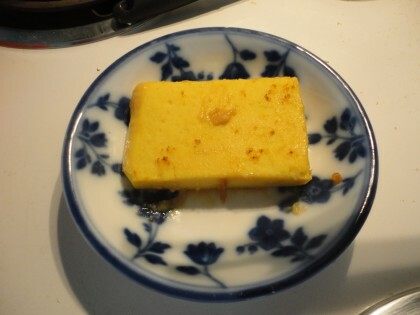 Since the yellow lentil tofu is a bit more dense and water absorbent than the chickpea tofu, the tiny amount of oil might have helped in cutting it and getting desired sized pieces out whole. But it may not be necessary at all, so if you don’t have any oil in the house, don’t worry about it. Notes: As you will see on Delicious Everyday, the chickpea flour tofu is made this exact same way, with two key differences: there’s no presoaking of the flour required, and half the 3 cups of water (1 1/2 cups) is initially whisked into the flour, tumeric and salt, which the remain 1 1/2 cups get brought to the boil. So what do you do with this stuff? A quick recipe search will reveal that it makes a great eggless salad. I am here to testify that is absolutely true. Either kind will work. The chickpea flour version is a little lighter. Here is a quick eggless salad I threw together with it. I didn’t have vegan mayo so I used homemade hummus and mustard and chopped radishes and green onions and parsley with spices like tumeric and my “As You Wish” spice blend and, of course, garlic. 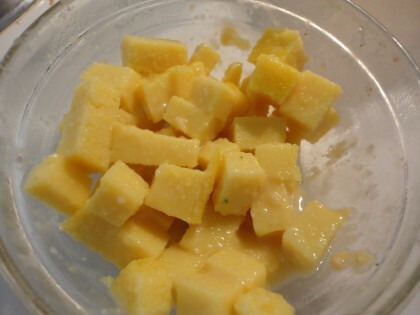 Another thing you can do with Burmese style tofu is cut it into cubes and add it to stir fry like you would soy tofu. Here is a stir fry with black rice and broccoli I added some to, after tossing it in a mixture of lemon juice and a dab of chickpea miso (as shown in the photo at the top of this post). The question remains whether this tofu can be marinated and baked in slabs like soy tofu? I’m not sure yet. I did try pan searing it in Anytime Sauce, but the sauce burned to the pan before I felt like the tofu was really browned. See bad photo below. I’m wondering if I slathered it in Chipotle Barbecue Sauce if I could broil it like one might broil polenta. There’s still lots of options to explore. In the meantime, turns out it makes a great eggless scramble. 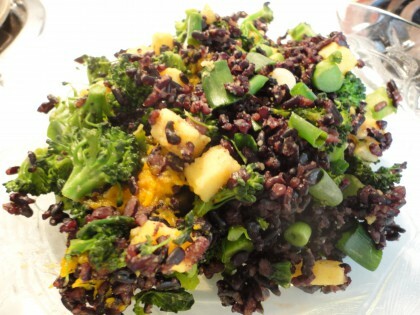 I did nearly the same thing to the Yellow Lentil Tofu as I did with the Chickpea Tofu when I made eggless salad. The leftovers of that salad got added to the pan after the veggies were cooked. It was pretty darn good. I used bits and pieces of veggies that needed to be used up, like part of a red pepper, part of a zucchini, and little broccoli and even some brown rice. Here’s a picture of my “scramble” before I dug into it. Meals with this new-to-me kind of tofu are still a work of fusion-in-progress in my kitchen. If you decide to try this, let me know what you come up with in yours. Here’s to mix-and-matching traditions! Maria, this looks great! I am anxious to try it, since I am vegan, GF, oat, corn and soy free, it sometimes feels like there aren’t a lot of options. I’ll let you know how it comes out. I really miss polenta, although with all the GMO stuff out there, I’m probably better without it. Can’t wait to get started! Thanks! I had no idea there were non-soy versions of tofu! And it sounds pretty easy to make, and so versatile (as is soy tofu). I finally had a tofu scramble recently (it’s a bit sad it took me this long to have one!) and it was quite tasty, but on days I don’t want to have soy, this sounds (and looks) like a great change. I liked the story about your neighbor growing up; the sharing of foods and traditions. I had similar friendships growing up, and I’d hate to imagine how less I’d be were they forced out of the neighborhood. Enjoy all the various tofu fun! Hi Veronica–I had no idea either, and got pretty excited once I read about it and started surfing around and learning how to make it. 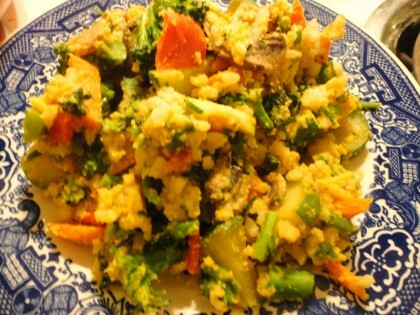 Nothing like a good tofu scramble–glad you got around to trying it out. I’d be interested to know what you think of this and what you do with it if you try making it. Thanks for your kind words about my neighborhood story, too. Nice that we share similar priceless memories. Here’s to varied tofu fun! Neat! Gotta try this soon. Thanks Stephanie–hope you like it! I loved hearing the stories of your family and how you shared the various family favorites with the neighbors of different backgrounds. With a little Burmese tofu, some mustard, pepper and salt, a little lemon juice, you can blender up a mayonaise too. The more tofu you add, the creamier it gets. I made the quick chickpea tofu from Delicious Everyday – fantastic & so good! I found “dry” frying the cubes works great – crispy! I use stainless cookware ordinarily but for dry frying I use a non-stick pan (PFOA free). Next time I’ll experiment with adding spices to the mix to flavor the tofu. Can’t wait to try both the eggless salad and scramble! Thank you, Maria! You’re welcome, Carrie! So glad it worked out for you. Could you give us more specifics on your dry frying techique? I tried doing that by letting them sit in the skillet but all the browned part did want to stick, even in a non-stick pan. (This was with the yellow split pea recipe though.) But it bumped the flavor way up to new heights, so I want to try again. Thanks for posting your successes with us! Sure! What works for me is first letting the surface of the tofu dry on a lower heat in the pan without moving the pieces. Once a dry skin has formed, the pieces can easily be moved around. At that point I turn up the heat for browning/crisping. Another thing I did was sprinkle the pieces with garlic powder before browning – delish! I hope I helped and everyone has success with crispy tofu! I just wanted to say I have had the pleasure of eating Shan tofu in Burma. It is called Shan because that is the area it is from. They cube it on the thin side and warm it up on a hot griddle where it picks up all the other flavor that were also on the griddle. It was wonderful. I have tried to copy it at home with no luck. It’s missing what ever those other flavors were. There big into spicy hot. And of course there was some oil on the griddle. Welcome, Charlotte—-so neat you got to eat the real thing in Burma! I wasn’t sure whether all of it was called Shan Tofu or where the name came from so thanks for that clarification. I did read that they like it spicy and also deep-fried. This is obviously not that, but I am really interested in ways people come up with to use it to tasty effect. Thanks for sharing your authentic experience with us! I love this Maria, what a cool idea, I never heard of this before and have been vegan for a while now! I have a bit of besan left (chickpea flour) so I hope it is enough to try this! What an easy, inexpensive option! I can’t wait to play with it! I’ll check back in if I discover anything worth posting about! Thanks so much! Welcome, Charzie, and thanks! I felt the same way when I first heard it, and used my last cup of chickpea flour to try it out. 🙂 Have fun playing with it and do let us know how it goes. Thanks so much for introducing me to Burmese Style Tofu made with Yellow Lentils! I’ve made something similar using Chickpea flour and liked it so much I had to double the recipe so I’d have some to use in other recipes (rather than just for my own snacking!). I didn’t realize you could make it with lentils and I’m thrilled to have some ideas on how to use it – THANK YOU! Yum! Hello Maria, is it okay that I call you Maria? Please let me know your preference. I appreciate your response, actually the fact that you actually respond to each message amazes me! You make it such a personal experience, like one friend writing to another; and who doesn’t need more friends! Thank you again. How long will this keep refrigerated? Has anyone had success freezing it? Hi Laina–welcome, and thanks for your comment. I’ve had it keep for up to a week–it continues to “weep” some extra water, so as long as you empty that out, you should be fine. I haven’t tried to freeze it though. I imagine the yellow-split pea version might freeze better since it is a little more “hardy” but I don’t know for sure. Would welcome input from anyone who has tried to freeze either version. I just made this about 45 minutes ago. I’m in the curing process, then cooling, then, well, eating. I’m looking forward to trying it out! It was so simple to make! If you’re using a blender, add 1/2 cup water before you blend, then as needed, in 1/4 cup increments, as you blend to get that “tornado” effect. I ended up adding about 1.25 cups. This will make a thinner liquid, but that’s fine, as it will thin out during cooking. Cook longer, if needed, but not more than 2 or 3 minutes more or you’re risking burned lentils. Thanks Joe! Hope you enjoy it. This is in our regular rotation with either chickpea flour or lentils ever since I got pregnant. I crave it like crazy! 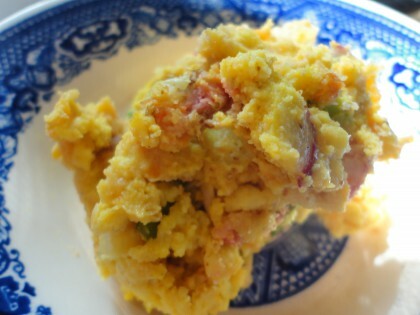 We eat it most often as a scramble, though it’s also excellent brined as “to-feta”. I just made this, but with different ratios. I used 1.25 cups of dried yellow split peas rehydrated. I then blended in a Nutri Ninja (One of those juicing blenders) with only 1.5 cups of water. Made a smooth paste, which I then heated for and whisked for only about 4-5 minutes before setting. It pan fried really well and has not yet started to leak excess water. Thanks, Clay, for the helpful feedback. I’m thinking the higher tech methods you used get it blended to a degree that helps reduce the sweating. Awesome! I’ve just made the yellow split pea versio but didn’t read the instructions properly! I added all the water to the food processor then realised my mistake. I stirred it on a medium heat for the required time and it still worked. Thought you might like to know.